"Speaking about European Values and Citizens' Rights in Multicultural Schools"
The Jean Monnet European Center of Excellence – University of Athens invites Secondary Education Teachers to participate in the 8th and last European Training Seminar “Talking about European Values and Citizens’ Rights in Multicultural Schools”, in the framework of the Jean Monnet Projects, of the EU Erasmus + Program. The training will be made by University Professors and educators with proven experience in European issues. The seminar is addressed mainly to Secondary Education teachers (active and future) of various specialties. It will also be open to participation in teacher training services. The seminar will take place on 21 April 2018 in Athens, at the Lecture Hall of the European Public Law Organization in Plaka (Polygnomou 2 and Dioskouron, Athens 105 55). Participation in the Program will be free of charge. The program also covers coffee and lunch. The maximum number of participants in the seminar will be 34, so a priority will be met. Interested parties should send the attached application form (Αίτηση_PEVCMC_21 Απριλίου) completed in electronic form at jmcenter-athens@pspa.uoa.gr, by Monday, 2 April 2018. 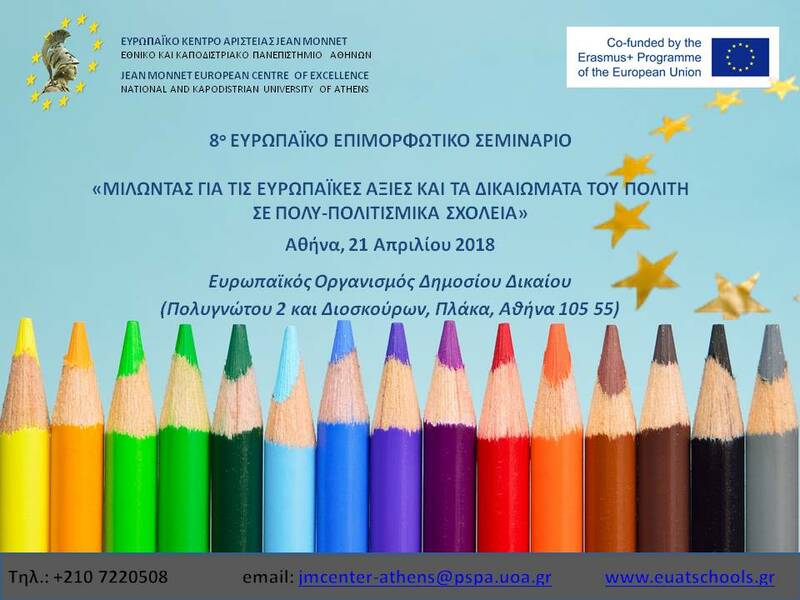 Contact: 210 7220508 or visit http://www.euatschools.gr/ and www.jmce.gr/. EUROPEAN EDUCATIONAL SEMINAR "Management of the EU's External Borders in the Eastern Mediterranean"